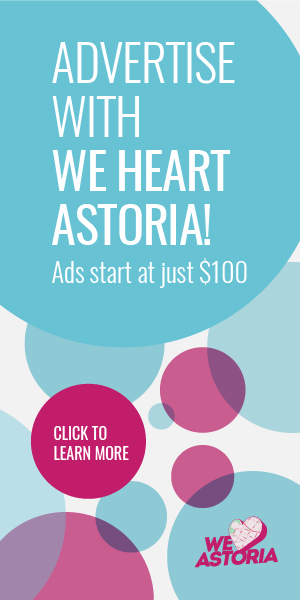 Here at We Heart Astoria, we’re passionate about exploring new, exciting eats around town. 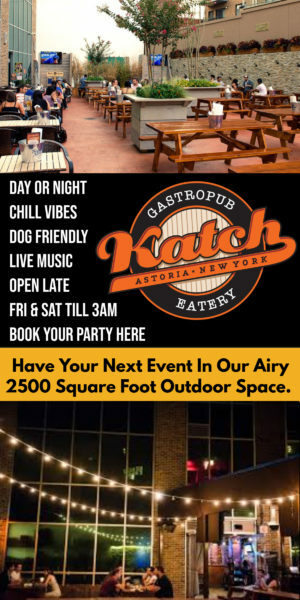 Recently having the pleasure to sample Bear’s new winter menu, we enjoyed ourselves quite a bit and thought you should know about the yummies happening in the Eastern side of town (Eastern in more ways than one :)). 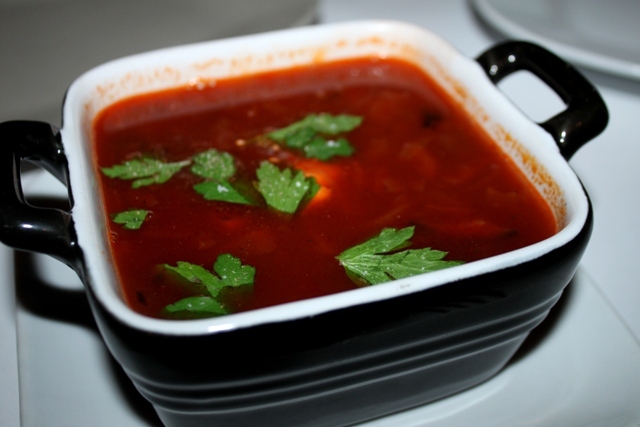 Classic Borscht – Who doesn’t love warming up in the winter with this old school Russian soup with a modern twist? Even though this totally reminds me of the lunches I had at my childhood friend, Inna’s house, there’s something light and modern and refined about this one – they go light on the sour cream, which makes it easy to save room for other goodies. 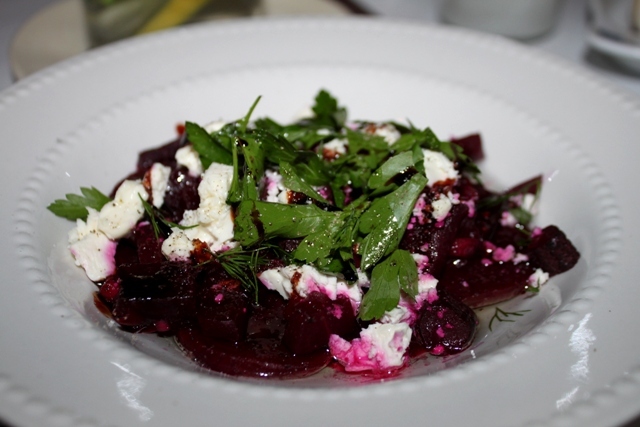 Beet Salad – I never tire of beets and can eat them year round. Being this is a primary ingredient in Eastern European cooking, Bear’s rendition does a great job of honoring it. The beets are cooked to perfection (slightly tender but not overcooked) and the goat cheese injects a little tang of savory goodness. 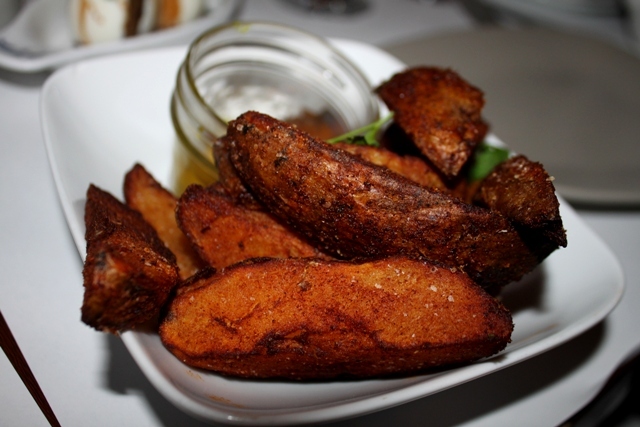 Paprika Fries – We all got excited when we saw these giant, hand cut fries and immediately attacked them. They’re really fabulous and great for sharing – the paprika seasoning stands out but isn’t overpowering, and the homemade garlic chive dip disappeared in minutes. 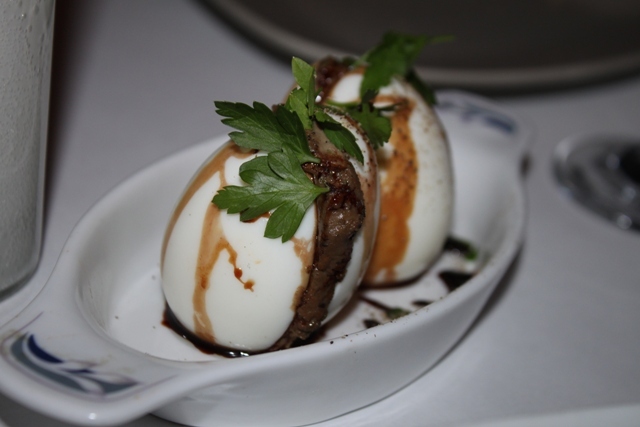 Deviled Eggs – Certainly a different take on Deviled Eggs, I enjoyed its Eastern twist with smoked fish and fresh herbs. Expecting the fish to have a strong flavor, I was surprised by how mild and almost muted it was. While I enjoyed Bear’s interpretation of it, I thought their other dishes spoke louder. 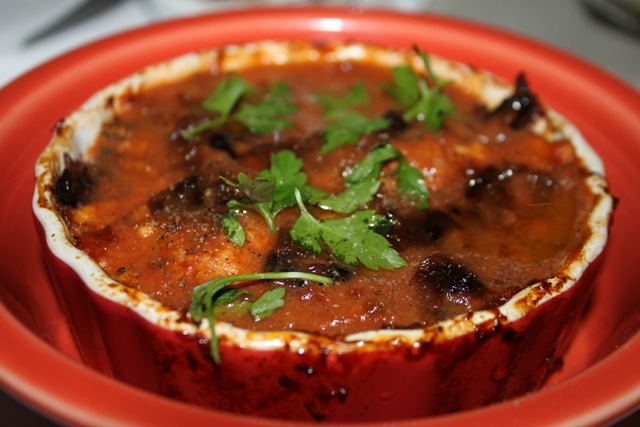 Trout in Tomato Sauce – And speaking of louder, this dish spoke volumes to me. Bubbling up with flavor, it contained pieces of pan seared trout, tomatoes, and onions, which married together to form the most fragrant and delicious braising liquid. This dish is all sorts of comforting and makes for a fun way to share a meal with friends. Veal Sausage – Really happy to see this homemade sausage on the menu, it’ll please virtually any meat lover in the house. Its flavors are delicate, the meat is moist, and bejeweled with earthy herbs and spices. 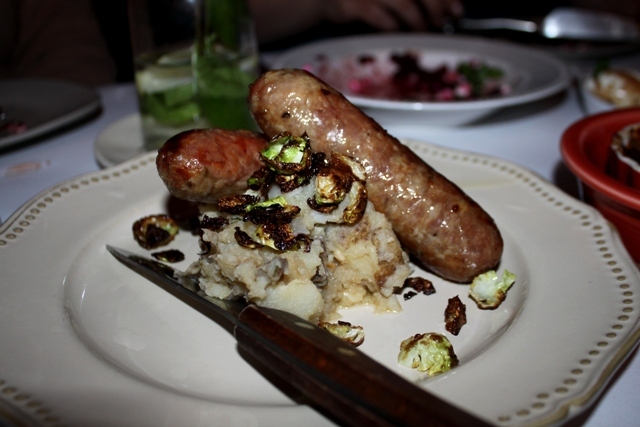 A side of mashed potatoes and pan fried Brussels Sprouts makes this the ultimate winter medley. We hope you try some of these delectable winter eats, along with other new things that pop up on the menu, daily. It’s fun to see those little inspirations and bursts of creativity from Chef Natasha which are just another reason we continue to heart Bear.